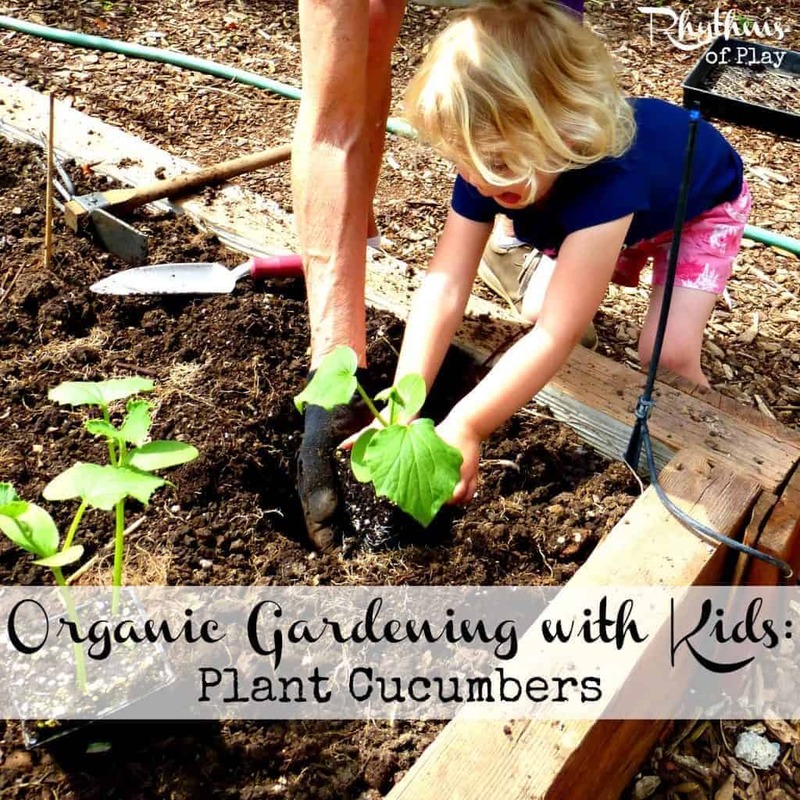 Organic gardening with kids is simple. Kids learn by imitation and naturally want to do what the adults around them are doing. Get to work and they will too. There is no need to teach, only to guide. There is no need to ask, only to offer. There is no need to make them do anything… just allow them to help when they are ready. My daughter has been around us gardening here and there since she was an infant. Last season she did her own thing while we worked. She didn’t help much but she was watching everything we did. This season she is only 2 1/2 but she helps from start to finish constantly asserting herself saying, “I want to do it!” We step out of the way, allow her to do it, and offer gentle guidance & assistance when needed. Today we are going to learn how to put cucumber starts into the ground organically. 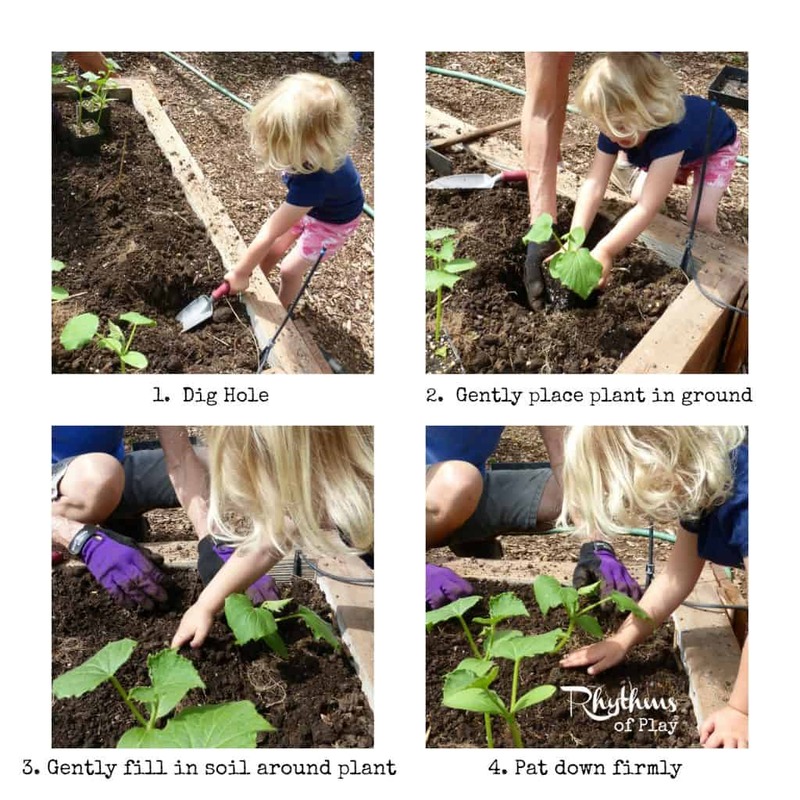 This is the sequel to an article I recently posted titled “Organic Gardening with Kids: Starting Cucumbers & Melons.” We use raised beds but you can also plant them right into the ground. 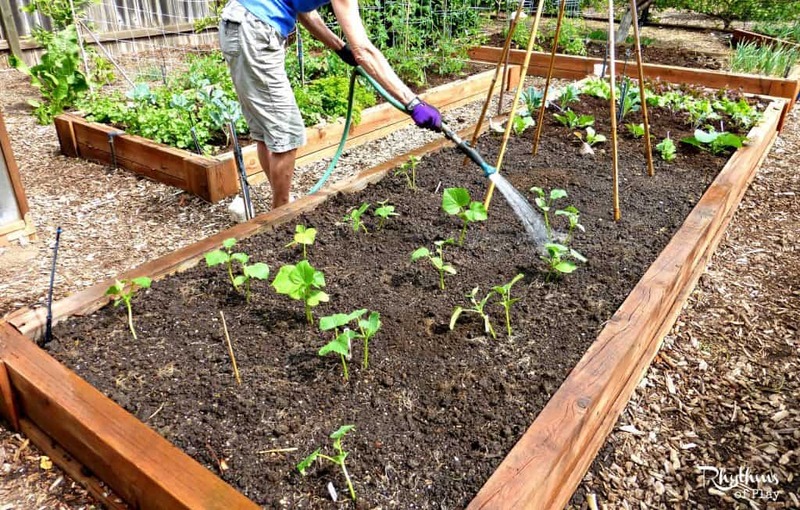 Cucumbers don’t transplant well so many people start by planting them right into the earth. If you want to extend your growing season, and maximize your yield, you can successfully transplant starts that are 3 -4 weeks old. You can start them yourself or purchase them from your local nursery. We added the compost while my daughter was at the compost bin putting compost into her own wheelbarrow. We had already finished adding the compost but it is important to allow your child to contribute if they want to. We didn’t even know she was getting compost. She just copied what she saw her grandma do. 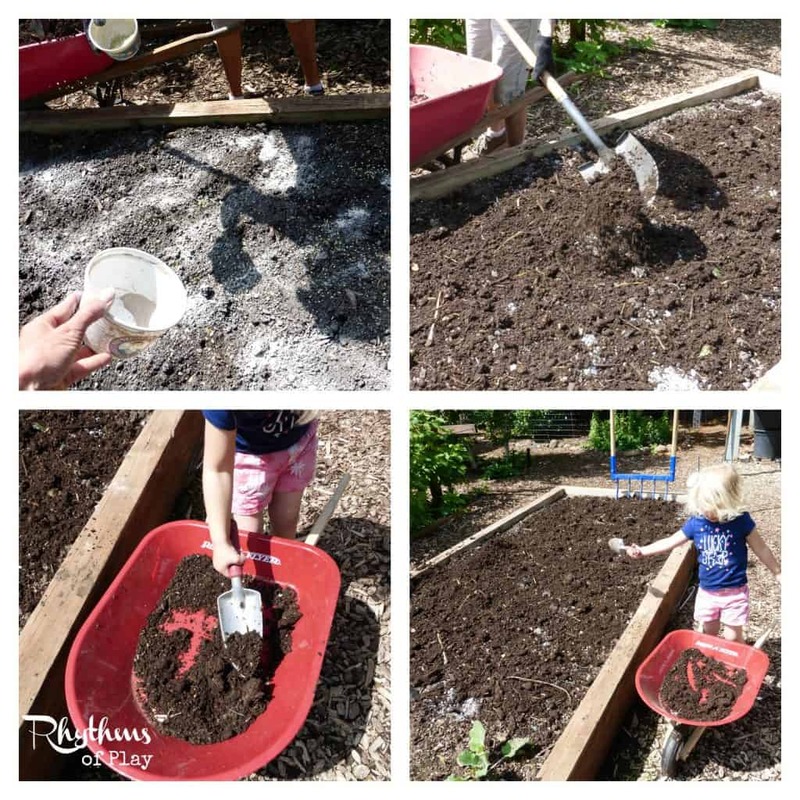 When she came around the corner with her wheelbarrow full of compost we acted like we acted like we really needed her to help us finish putting compost in. This is how amazingly confident and helpful workers are created. Just be a good model and they will follow — even when you least expect it. I have provided an amazon affiliate link to this awesome kids Wheelbarrow . I earn a very small commission with no extra cost to you. My daughter loves this wheelbarrow and uses it for many things including gardening. 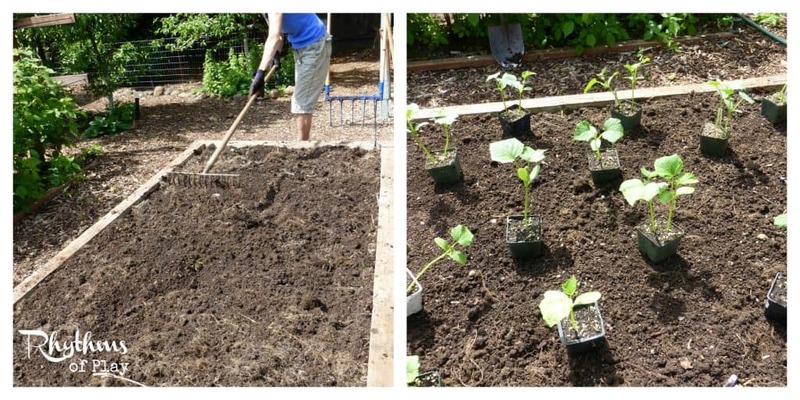 Use cultivators, garden forks, or a broadfork to turn the soil and mix in the amendments. My brother works for an awesome company that makes and manufactures garden tools and electric tractors. My mom already has a broadfork, but my brother claims theirs are better so we put them to the test. 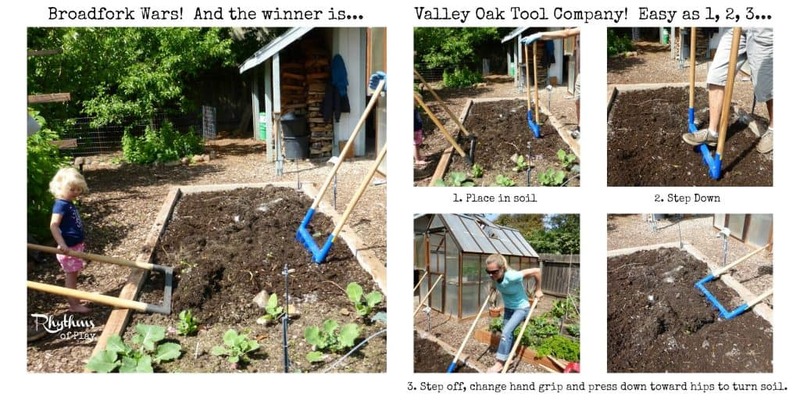 All three of us used both and loved Valley Oaks Broadfork the best. And right now they are on sale! Click the link to learn more. Please know that I am not affiliated with Valley Oak Tool Company in any way other than the fact that my brother is an employee. I was not paid, will not be paid, was not given free product, and will not receive a commission should you click-through to purchase. This is an awesome American made and manufactured tool company doing their best to do whats best for both our country and the environment. All opinions are my own. Remember: cucumbers do not like to be transplanted and will not survive if not handled very gently. Be very careful not to disturb the roots while planting. 6. Water cucumbers in and clean up. This is awesome! I thought cucumbers had to be grown on hills for some reason, lol, so I’m really excited to know that we can grow them in our raised garden this summer! Cucumbers can be grown on hills and many people grow them that way. They can also be trained to grow up a trellis or fence. We tried growing them up last year but didn’t like it so we went back to just putting them right into our raised beds.